Low Maintenance Synthetic Grass: Where Will Your Kids Play During Fall? You’re already tired of the hassles — and costs — that go along with watering and maintaining your turf lawn. Worse, you’re already sad over seeing your natural sod grass wither under the rules of local water restrictions. Your children have suffered injuries on those same play areas — or on the lawn. Low maintenance artificial grass makes a real difference for kids with special needs. The grass that’s great for romping on is making everyone’s allergies go off the charts. 1. The hassles and costs of watering and maintaining your lawn. WaterSense, an EPA partnership program, estimates that nationwide, irrigating home landscapes accounts for nearly one-third of all residential water use. In fact, it totals nearly 9 billion gallons per day. In some regions, like California,a 60 percent of home’s water bill goes toward lawn maintenance. 2. Droughts and the expansion of water restrictions. NewGrass® applauds and supports water conservation nationwide. Water is, after all, among our most important natural resources. And it’s also the one for which we haven’t found a man-made or natural option. In response to ongoing drought conditions and calls for water conservation, many have responded. Local water districts, regional government authorities, and states are enacting watering restrictions. According to the Association of California Water Agencies, 59 agencies and cities — including Los Angeles — have enacted mandatory restrictions. In addition, they may have declared Stage 1, 2, 3 or 5 water alerts. Also, other cities have suggested voluntary restrictions. Several of the largest cities in Texas have ordered mandatory water restrictions. Yet, synthetic grass is the answer for water conservation. 3. The mess of gravel and dirt play areas in rainy or snowy weather. A study published by JAMA Pediatrics found that nearly half of all U.S. preschoolers don’t even have one chance each day to play outdoors under a parent’s supervision. And that’s in good weather! “Preschool age children should get at least 60 minutes of moderate to vigorous physical activity a day,” says the report’s author, Pooja Tandon, MD, MPH, of Seattle Children’s Research Institute. “Yet, many preschoolers are not meeting that recommendation. 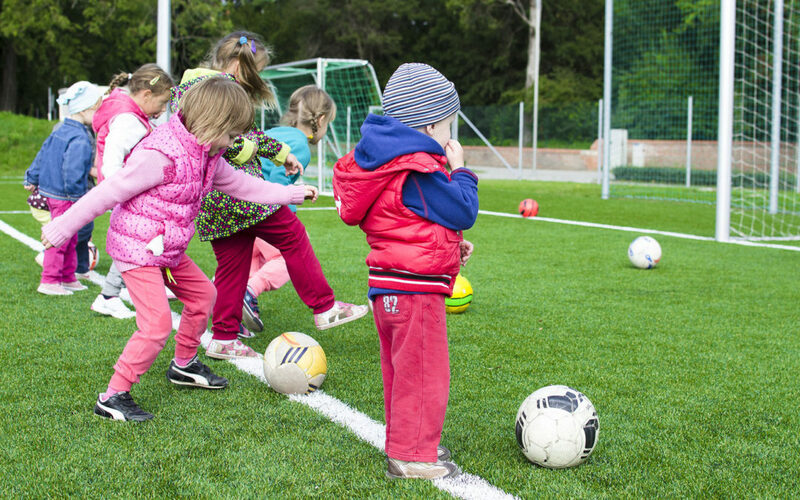 Young children need more opportunities to play outdoors and to help them be more active.” Synthetic grass encourages physical activity. Also, you may have heard sand and wood chips cushion surfaces. Yet, both are messy, scatter easily, routinely need replenishing and are unusable after snowfall or heavy rain. 4. Injuries on turf grass and gravel play areas. More than 500,000 children a year incur injury on playground equipment, according to the American Academy of Orthopedic Surgeons. In addition, three-fourths of playground injuries are the result of falls. So choosing an appropriate surface is the most important playground decision school officials can make. Low maintenance synthetic grass is a great choice. However, the same is true when considering a surface for a play area at home. In fact, about one-fourth of all serious playground injuries occur in the backyard, according to the U.S. Consumer Product Safety Commission. Yet, children aren’t the only victims of injuries related to turf grass and play areas. The Earth Institute says 60,000 to 70,000 severe accidents result from lawnmowers every year. 5. Allergies and other ailments spawned by sod grass. Itchy eyes and nose, nasal discharge, blocked nasal passages, sinus headache, sneezing, wheezing, coughing and shortness of breath are all symptoms of allergies. Furthermore, dust, mold, pollen, grass and trees are the cause. Allergies have no cure. Prevention is the only course of action – trying to eliminate or minimize a child’s exposure to allergens. Another option obviously is synthetic grass. For instance, NewGrass® has fibers that are broadloom-tufted from high-quality polyethylene, a non allergen component. Play areas covered by sand and wood chips can attract cats. Why? Because they consider these coverings to be one big litter box. Hence, why low maintenance artificial grass is a preferred for ground cover. if you would like to know more about the benefits of synthetic grass, contact us. Consequently, we will be happy to answer your questions. NewGrass is available all over the US. As such, we are familiar with the nuances of synthetic grass as it relates to local climate type. So contact us, we can help!